in-box v4.8.0 is the latest tool for made iOS devices to fix different issues and errors. This latest tool easily unlocks the account of iCloud devices. The in-box tool software is run on all PC windows versions and compatible with all Apple products. This is really hard to break into apple’s security and apple makes sure of it every time they release an update or a new device. 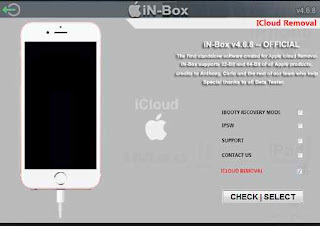 Now with the help of in-box v4.8.0 iPhone iCloud remover, it is possible to unlock the iCloud lock easily within seconds. Remove any iOS iCloud Lock. Laptop or PC with Windows operating system. First, download the in-Box tool at the given link. Open in-Box V4.8.0 Zip with an extractor like WinZip or WinRAR. Now place the tool wherever you want. Run the in-Box with as an administrator. Then click on Unlock and wait a few seconds. Finally, your icloud lock will be removed. This latest tool also unlocks remove any iOS lock, iCloud lock, FRP bypass of android phone, change IMEI, privacy unlocks and so on. If you wish to flash your phone device without any damage, then in-box will help you to fix these problems without any risk. The in-box v.4.8.0 is really a useful tool to remove iCloud on your iOS device. This latest tool is compatible with all windows versions like XP,7, 8, 8.1,10 and Windows Vista. This latest tool features made it unique and it’s easy to operate with your device. So click the given link and free download it and start unlocking your device without any cost.